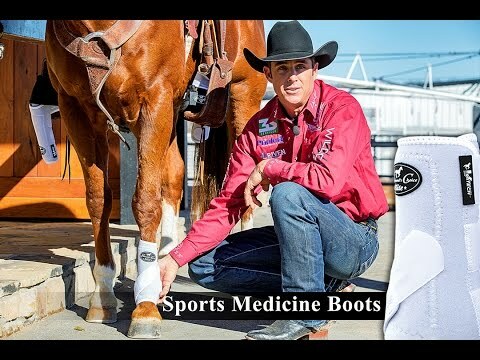 VenTECH™ Elite Sports Medicine Boots are lightweight and multi-layered with VenTECH™ ventilated limestone-based neoprene exterior and UltraShock™ lining. The ventilated neoprene conforms to your horse, allows heat and moisture to escape, and keeps your horse cool, comfortable, and performing at its best. The boots provide 360 degrees of impact protection, safeguarding the cannon bone, tendons, and soft tissue, and are proven to absorb over 26% of energy from hoof concussion. The uniquely designed suspensory strap stretches with each stride, allowing full ankle movement and helping to eliminate hyperextension of the fetlock. I really like how these boots fit my horse, however I was extremely disappointed with the color. I ordered the crimson red color and I got boots that were a very dull red and they do not match the bright red picture that was provided. I do extreme mountain trail and these boots have wonderful protection! My horse can go through tricky obstacles and water without the boots hindering his range of motion or rubbing. I would recommend buying the 4 pack instead of the fronts and hinds separately because it is more affordable. My three year old is recovering from fetlock surgery and I needed a lightweight support boot for his turnout after 2 months of stall rest. BEST ANSWER: It would really depend on the size of her legs. If she is one of the fine-boned Arabs, small would be fine, but if she has larger bones, I would go with a medium. These boots would definitely protect her fetlock joint but I would keep a cloth bandage on it until it was completely healed. Good luck. If your horse is under 15 hands, has fairly small feet and is fine boned I would think a small would be fine. My two Morgan geldings, both of whom are 15-2, needed a medium. I use on small large pony. Depends on length of her shin bone. As to protection for old injury, I don't know. Is this a four pack? BEST ANSWER: These are only for the rear legs of your horse. Only a two pack. This is only a two pack for your horses rear legs. No this is a pair of boots for the hind feet. Will the small size fit a pony? The SMBII come in Extra Small and fit a pony up to 14 hds.